Your choice of cheese, three pieces of applewood smoked bacon on a gourmet pretzel bun. 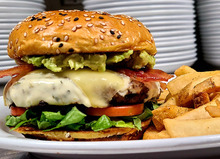 Topped with avocado ranch, fresh avocado, applewood smoked bacon and Monterey Jack cheese. 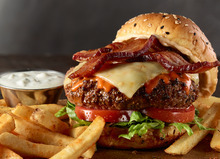 Topped with wing sauce, Monterey Jack cheese, jalapeno bacon and smoky sauce. Served with your choice of wing sauce, ranch, or bleu cheese for dippin'. 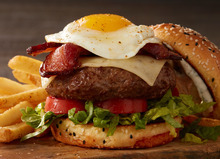 Topped with sunny side up egg, your choice of cheese, applewood smoked bacon and garlic aioli. 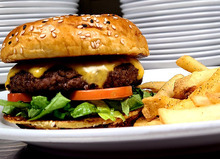 Your choice of 4 single patty or 2 double patty mini-burgers with American cheese and grilled onions. Your choice of cheese, three pieces of applewood smoked bacon. One third pound of moist all white meat turkey patty topped with Monterey Jack cheese and garlic aioli. Spicy black bean, grain and vegetable patty topped with Pepper Jack cheese and garlic aioli.